Gov Newsom Orders Guard Back! Home » News » Local News » Gov Newsom Orders Guard Back! 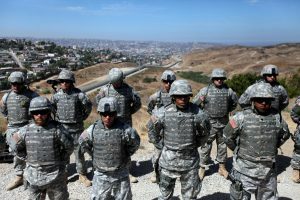 California Governor Newsom, in an obvious rebuke to President Trump, Signed an order today withdrawing the California National Guard Troops from the border. The action was done in advance to Newsom’s State of the State speech scheduled for tomorrow, in Sacramento. Newsom plans to say the border emergency is a manufactured crisis and California will not be a part of this political theatre. Newsom’s office plans to redirect 110 National Guard personnel to help prevent and suppress wildfires. 360 currently deployed at the border will be assigned to anti-drug operations and some will stay at border points of entry to screen illegal drug traffic.